of each. Call or Email Today !!! We purchased Burbank for Sayer & Son in the recent Greenbrier Dispersal. will you be able to receive volume discounts. Call Today!!! 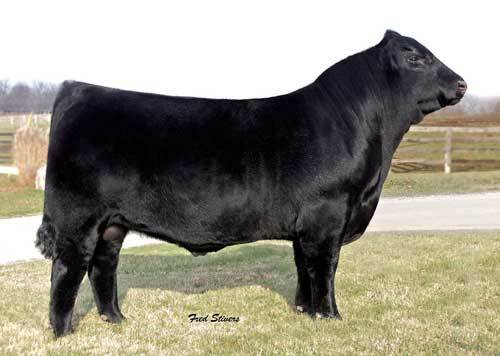 —DVFC Sitting Bull 936R x MAGS Restless 2410R These calves will be Homo Black and Homo Polled and very good. I have seen two yearling heifers from this mating and they were impressive. —SAV Net Worth 4200 x MAGS Pillow Book 519P These calves should test Homo Black and Homo Polled and should be really stout. —Wulfs Walcott F711W x HMMP Liberty Belle 784T These calves will be Homo Black and Homo Polled and have a very strong set of numbers all the way across. —SAV Net Worth 4200 x TMF 39J. These LimFlex embryos should test Homo Black and Homo Polled and have outstanding EPD's as well as be great cattle. —RADS Black Prodigy x SLVL Ms Raven 192D. These purebred calves will be Double Black and Double Polled and have solid EPD's. —AUTO Dollar General x JCLC Ebony Mist 76 J. These Purebred calves will be Homo Black and Homo Polled and have outstanding EPD`s. —AUTO Dollar General x D`Hanis Black Visions 054C. These Purebred calves will be Homo Black and Homo Polled and have outstanding EPD`s. —SAV 5175 Bando 1029 x Turner Miss Erica 44. These will be Angus calves and will have outstanding EPD`s. —Bon View New Design 208 x Monogram Queen Erica 8454. These will be Angus calves and will have outstanding EPD`s. With calves from this mating you will have 22 of 28 immediate family members that are Pathfinders. —HARB Pendleton 765 JH x D`Hanis Black Visions 054C. These LimFlex calve should test Homo Black and Homo Polled and have awesome EPD`s. —AUTO Dollar General x TMF Extra Sweet 39 J. These Purebred calves will be Homo Black and Homo Polled and have outstanding EPD`s. —MAGS Twain x CLLL Mongoose. Homo Black and Homo Polled mating. Her last natural heifer is working in the London Limousin program in Arkansas and looks outstanding. These should be quality calves with solid numbers. AHCC Westwind 544W x HMMP 784T. These calves will be Homo Black and Homo Polled and have unbelievable EPD's all the way across. Top Genetics found here! Coleman Production 608 x HMMP 784T. These calves will be Homo Black and Homo Polled and have an outstanding set of EPD's. Top LimFlex genetics. and also other embryos that may not be listed on this page.